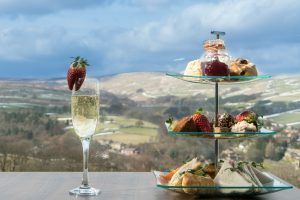 Boasting spectacular views and first-class modern facilities, Sheveling Wine Estate at Holmfirth Vineyard is a truly stylish venue at which to host a private party, business trip or corporate event. Our venue is fully versatile. This means it can be adapted to suit your requirements and budget, whether you’re planning a Networking Event, Conference, Exhibition, Gala Dinner, Drinks Reception or Private Celebration. The Solaris Suite can accommodate 120 people for a sit down meal or Conference and 140 for a party celebration. Our restaurant, outside terrace and conservatory are also available for exclusive private hire on request. We offer a selection of popular corporate experiences including Wine Tasting Tours, Team Building Days and Food & Wine Pairing Experiences, all of which can be arranged for small and large groups. With the option to add a tour and tutored wine tasting session to your package as a special touch for guests, we can help make your event truly memorable. The Retreat complex, located at the foot of the vines, also provides the flexibility to offer the option of an overnight stay to guests attending your event. Alternatively, hire out the entire venue for an unforgettable team weekend away. Our Afternoon Tea is renowned! Please choose which type of Afternoon Tea you’d like to book below. Simply fill out our quick form to download your brochure.